D.S. Eom, D.M. Parichy, “A macrophage relay for long-distance signaling during postembryonic tissue remodeling,” Science, doi:10.1126/science.aal2745, 2017. 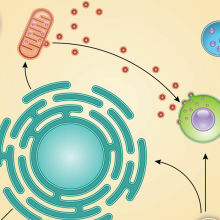 Macrophages are increasingly appreciated as important mediators of many physiological processes, from homeostasis to tissue remodeling. But the recent discovery of a new role for the immune cells comes from an unexpected source: the stripes that give zebrafish their name. Zebrafish pigmentation is directed by precursors to the skin’s yellow-pigment cells called xanthoblasts. 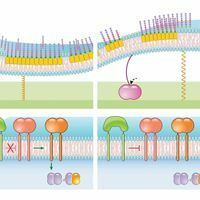 During development, these cells produce long, thin filaments tipped with vesicles containing signaling molecules that land on black-pigment cells called melanophores; once docked, these vesicles help arrange melanophores into orderly black stripes. 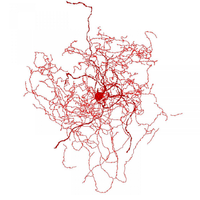 The vesicles’ wanderings were reminiscent of another cell type: the macrophage. 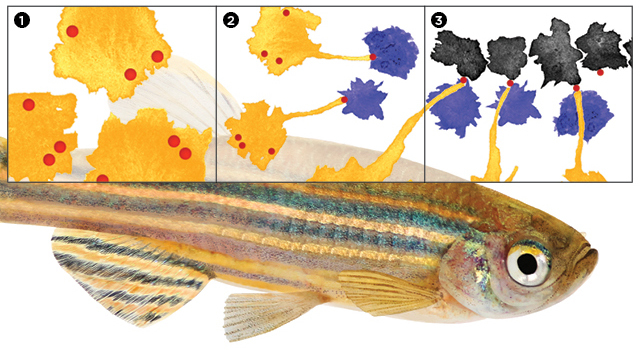 Indeed, when the pair depleted macrophages in baby zebrafish, they found that abnormal dark blotches appeared between the black stripes, indicating communication failure between xanthoblasts and melanophores. 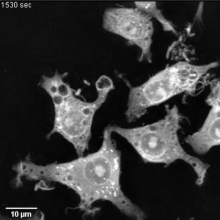 Further time-lapse imaging in normal zebrafish—this time with macrophages also labeled—revealed what was going on: the immune cells were engulfing xanthoblast vesicles and dragging them around intact. Then, on encountering a melanophore, each macrophage deposited its cargo and wandered off elsewhere.